These tomatoes are simply wonderful. You must use a top quality canned whole tomato. We no longer are able to get good fresh tomatoes even in the summer at our so-called farmer's market. Now tomatoes are grown to look good for days and days but taste like cardboard. p. 34 - I made a variation of this recipe. To fresh ricotta I added generous pinches of dried oregano, red pepper flakes and kosher salt. This mixture was spread on prepared crostini which had been rubbed w a garlic clove on one side. Fresh basil sprinkled on top. Some bruschetta were smeared w a sun-dried tomato mushroom tapenade prior to adding the ricotta. Truly scrumptious. Definitely will make these again....maybe today!! p. 48 Sadly, my mint melted into a sloppy mess in the crisper (and I use the term lightly!) of my fridge so, this was just plain old Grilled Chicken Pieces at casa bc. Nonetheless, we really enjoyed it. LRK has you toss the chicken pieces w evoo, lemon zest, oregano, salt & pepper then marinate in the fridge for 1 – 6 hrs. Ours marinated for 4 hours before sprinkling w salt and grilling on our new Weber gas grill outdoors. LRK provides indoor grill pan instructions too. Our chicken breasts were organic, juicy and flavourful and totally delicious served atop some roasted, balsamic glazed Brussels sprouts. 5 turkey wings cost $11.00. Stock needs to cook for 12-14 hours. Can use as base for tortellini en brodo. Made 8-22-11. What a great chicken recipe! You make a paste with the basil, dried herbs, pancetta, garlic, EVOO and some balsamic which you rub under and over the chicken skin. After that it's a basic spatchcocked chicken roasted over potatoes. My bird took longer to roast than the recipe suggested but I think it was slightly bigger. The end result is a flavorful moist bird with great roasted potatoes. The recipe suggests substituting 1/2 pound of fresh porcini instead of the dried version "if fresh porcini come into your life." Made this again, this time transforming it into a sous-vide affair. Put the chicken breasts, dried porcini mushrooms (rinsed, but not soaked) and minced onion plus 1/4 tsp salt into a vacuum-sealer bag. Sous-vide for 1 hour 25 minutes at 140F. Did not bother to sear the chicken breasts after the sous-vide stage was complete. Drained the juices from the bag into a saucepan and made the sauce as directed in the recipe using the wine, water, and butter. The dish was delicious but the presentation needs some work. Sous-vide with the porcini mushrooms in the bag infuses the chicken with wonderful flavor but it also stains the surface of the chicken breasts a odd beige/brown color. I will be returning to this recipe to further refine it, as it is too delicious to abandon as an ugly duckling. We left our chops in the marinade about 3 hours and then popped them on the grill. Next time we will take Breadcrumbs suggestion and let them marinade all day plus add more herbs. The chops came out flavorful, moist and delicious! We served them with a baked zucchini vegetable dish from "Cucina Fresca" by Viana La Place. Great combination! Grilled Lamb Chops with Onion and Oregano – p. 253 A simple prep yields outstanding results. This recipe produces an aromatic marinade that infuses the lamb with complimentary big, bold flavours. In addition to the dry oregano, I added the leaves from 2 sprigs of rosemary to the marinade mix. Though the recipe suggests you marinade for 1 to 2 hours, we let ours marinade all day. Also, while LRK has you drain the marinade prior to grilling, we opted not to. We simply lifted the chops from the marinade, placed them on the grill and basted w the remainder. Loved this dish and we’ll definitely make it again! Pg. 253. We did not have the same success with this recipe as the previous reviewer. We marinated the lamb for 3 hours and followed the cooking directions exactly, even cooking for longer than suggested and letting them rest 5 minutes or so. Still, our chops were undercooked -- we like medium rare, these were closer to rare. Also, the marinade just didn't add that much. We would have preferred them without the marinade. We won't be repeating this one. One of my favorite leg of lamb recipes- just be sure to heat the wine before adding. I lost a ceramic baking pan when I skipped this step. I made this as a side for Christmas dinner, simple and flavorful. Made this on August 21st, 2011 - excellent. Dave really liked the burned pieces. This is a simple but delicious side dish. I'm surprised I never thought about roasting red onions on their own before but it results in a slightly sweet tender onion. The thyme is a must in this recipe. 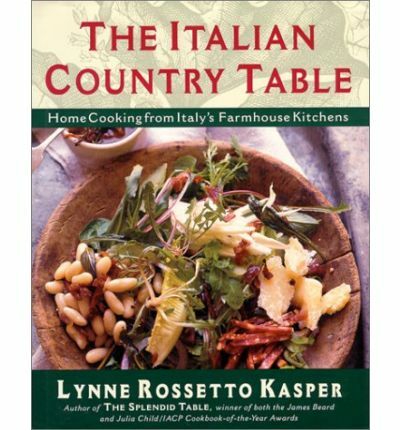 You will follow Lynne into homes throughout Italy, discovering more than 200 authentic recipes for regional appetizers, main courses and desserts, accompanied by anecdotes gathered firsthand from farmhouse cooks.